I’ve read three of the Road Home books so far, and this was the one I enjoyed the most by far (with Catwoman taking the title for worst). Bruce’s return, of course, has a huge impact on Stephanie and what she’s been up to since Bruce Wayne “died,” and this issue is pretty much what you’d hope for/expect: Bruce coming face-to-face with Stephanie and “testing” whether or not she’s worthy of wearing the Bat uniform. We also get a throwback to what may be happening with Cassandra Cain. The best part about this one-shot is that Stephanie doesn’t buckle under the pressure from Bruce, but rather maintains her fun-loving attitude, which has always been what differentiates her from Cassandra. Stephanie’s come a long way since her days as Spoiler/Robin, and her Batgirl title has been an entertaining, enjoyable read. Adored this issue. What I love about Jen Van Meter’s take on Black Cat is that her writing makes it clear just how much she cares about the character. There’s been a lot of time put into this mini-series, evident in the research that’s been done and the love with which the story was crafted. The final chapter of this four-parter wrapped up some loose ends in the thievery at hand and the Kravinoff family’s entanglement in the Spider-Man series. The best, and maybe worst part, depending on how you look at it, is the cliffhanger I didn’t see coming, wherein Felicia attempts to steal what we presume to be Captain America’s original shield. I would really love if they followed up on this somewhere, maybe in another mini or in a different Spidey title, but I’m not sure of the likelihood of that. 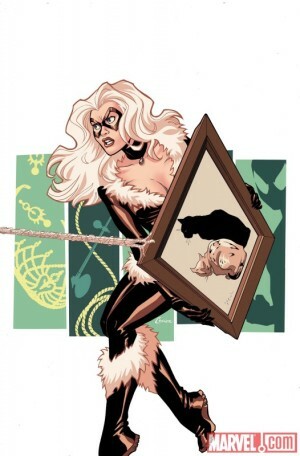 At any rate, I was happy Marvel gave Black Cat a chance at her own mini, and I’m still hoping for more with the quality provided by Van Meter. This entry was posted on 10/28/2010 by ravenhaired. It was filed under Comic books, Female Characters / Creators, Reviews and was tagged with Batgirl, Black Cat, Bryan Q. Miller, DC, Jan Van Meter, Marvel.